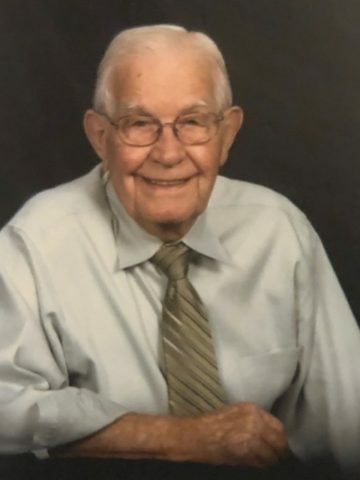 Howard Hunt Boone, 95 of Hendersonville, passed away on Tuesday, February 5, 2019. Preceded in death by his wife and love of his life for 70 years, Mildred Dean Petty Boone along with two sisters and six brothers. Survived by his daughter, Nancy (Jimmy) Carroll, grandson, Steve (Blair) Carroll, great-grandson, Bryce Carroll and sister, Bonnie Jean Sloan. Howard retired from Genesco and was a founding member of Hendersonville First Baptist Church where he taught Sunday School and sang in the choir. Howard played on the first Hendersonville High School football team in 1941. The family would like to thank all the nurses and techs on the 3rd floor of Hendersonville Medical Center, along with all the staff and his “buddies” at Brookdale who took such good care of him. A Celebration of Howard’s life will be held at Hendersonville Funeral Home on Friday, February 8th at 11:00AM followed by burial at Spring Hill Cemetery. Visitation will be held on Thursday evening from 4:00PM-8:00PM. We love Howard so much. He is truly going to be missed. A man among men. Always a smile on his face and a kind word. He will be missed. What a wonderful life! Sending lots of love to his “little girl”, Nancy and the apple of his eye, Steve. Love you all. I am so saddened to read of your wonderful Dad’s death, but know that he is with your sweet Mother again! I always looked forward to seeing your Dad…he always had such sweet things to say about everything !.. Please know that we send prayers to you and your family. Words can’t express what Mr. Boone has meant to me personally, professionally, to the HHS community and Commando football. Grateful and so thankful to have called him a friend and mentor. I am very sorry to hear of Mr. Boone’s passing. As many have said, always a smile on his face and kind words to say. It was always a pleasure to see to and talk to him. Prayers for all. I remember fondly of the times I got to speak with Howard. He had a graceful, even peaceful perspective on life. He was a great listener. I sat with him for a long time at my father’s service. He was a great comfort to me. He had provided comfort to my mother and grandmother as well. I got to thank him for all of this the last time I saw him, and I thank the Lord for that opportunity. All I can do now is offer my most sincere sympathy and condolences to his daughter Nancy and her family. At the same time, I celebrate the full life of a wonderful man, who has left the world a better place through his deeds. The Lord certainly has been waiting with a nice place for him. What a wonderful Man who’s smile and warm spirit made you feel good just being around him. As newcomers to FBCH Howard and his family welcomed us enthusiastically with Love and Kindness. His light shined bright, what a testimony of a WONDERFUL CHRISTAN MAN. We were truly blessed to have known him.